"Continuing the trend for more compact gear are the One Series 104 monitors from JBL. Designed as the ideal choice of monitor for recording musicians, podcasters, video producers, or indeed anyone who uses a desktop setup or lacks space and funds for full-size monitors." 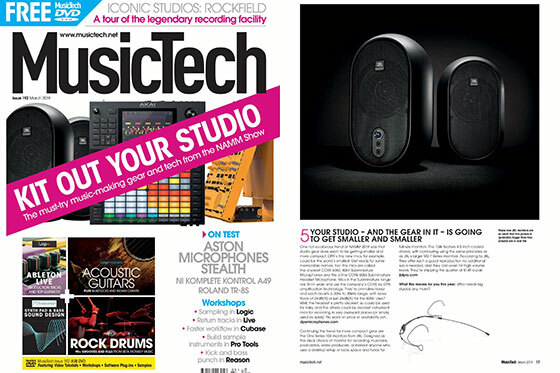 The new JBL One Series 104 powered monitors are featured on the cover of the new issue of MusicTech as part of the magazine’s NAMM Show overview. "The 104s feature 4.5-inch coaxial drivers, with contouring using the same principles as as JBL's larger M2 7-Series monitors. According to JBL they offer such a good reproduction no additional sub is needed, and they can even hit high volume levels. They're shipping this quarter at £129 a pair." The March 2019 issue of MusicTech magazine is on sale now. The JBL One Series 104 compact reference monitors will be available from March 2019 priced at £129 RRP inc VAT (Pair).